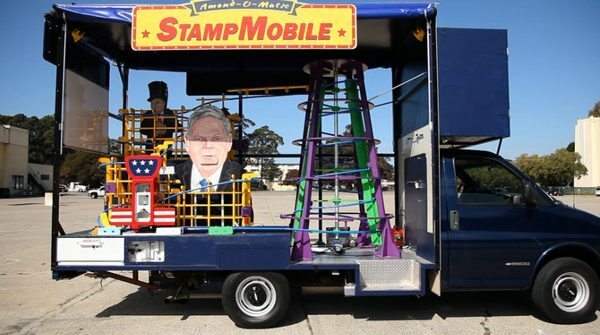 Step Right Up and See the Amazing Amend-O-Matic Stamp Mobile! 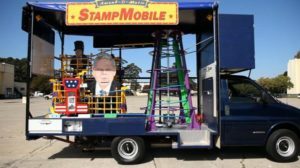 As part of our public education campaign about the harmful impact of Supreme Court’s Citizens United ruling, we created the Amend-O-Matic Stamp Mobile, a beloved Rube Goldberg-style, money-stamping machine mounted on a flatbed 21′ cutaway van. 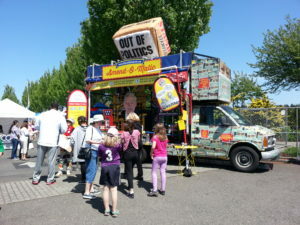 It has toured all across the country visiting events and festivals from the Kate Wolf Music Festival in Laytonville, CA to the Governor’s Island Art Fair in NYC. 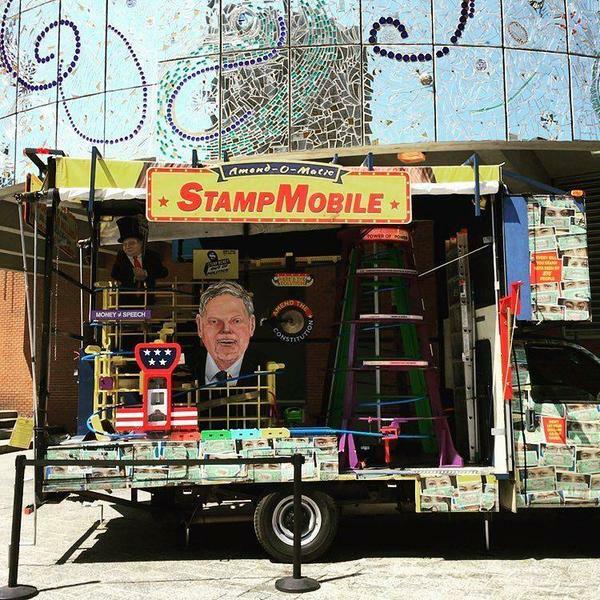 The Stamp Mobile was also the noted winner of the Common Ground Fair’s educational exhibit prize! On April of 2016, we celebrated its new home at the American Visionary Art Museum (AVAM) in Baltimore, MD. 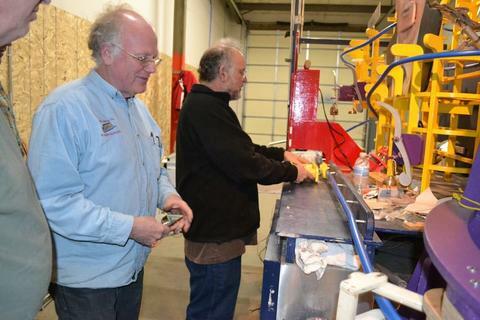 Our fun Stampede device is now on permanent exhibit at the AVAM – we couldn’t think of a better place for this Ben and Jerry creation to reside. So how does the Amend-O-Matic work? 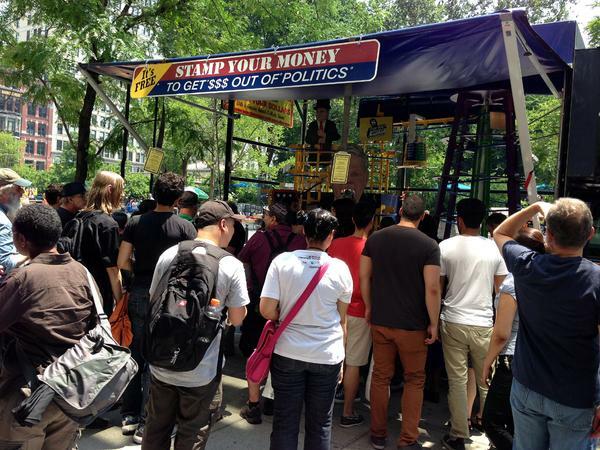 People approach the machine on the right and clamp their dollar bill into a platen, which rides on the miniature blue monorail. It enters the spiral elevator where the center rotor pushes it around and around until it reaches the top. It coasts down the winding monorail. 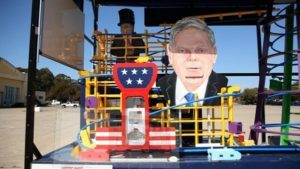 On the way, it pops up a sign that says “Corporations are not people.” Then it comes to a man dressed in a top hat. As it goes by the top hat and face swivels to the side and reveals that it’s hiding a corporate office tower. 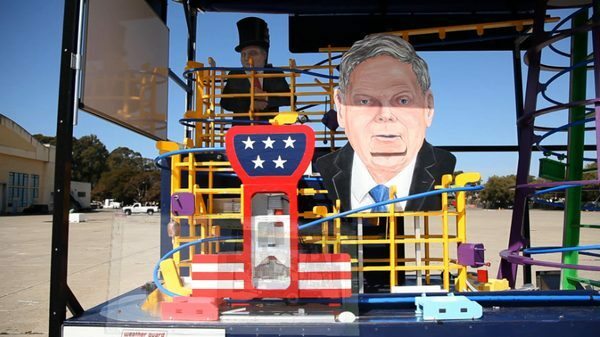 It rotates a sign that says “Money does not equal speech.” Then it comes to the face of a man. 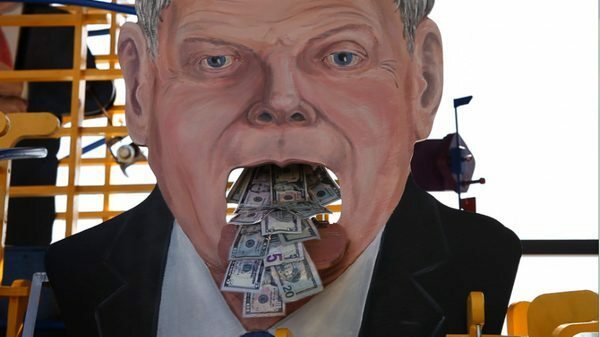 When it goes by, his mouth opens and money pours out. It arrives in the stamping station where the bill is stamped with one of two messages: “Stamp Money Out of Politics–Amend the Constitution” or “Not To Be Used For Bribing Politicians–Amend the Constitution.” Last but not least, the stamper takes their dollar bill out of the platen.